As reported by Blacklock’s last week, more detailed data on Tax-Free Savings Accounts was released by Canada Revenue Agency in response to an opposition question in the House of Commons. Rhys Kesselman and others have made the point that raising the contribution limit to $10,000 annually will reduce the tax system’s overall progressivity and add to the future costs of Old Age Security and the Guaranteed Income Supplement. The newly released numbers also underscore the fact that, despite claims that TFSAs facilitate saving for retirement, they are an inefficient vehicle for retirement saving, and a poor substitute for pensions when it comes to ensuring secure and adequate incomes in retirement. 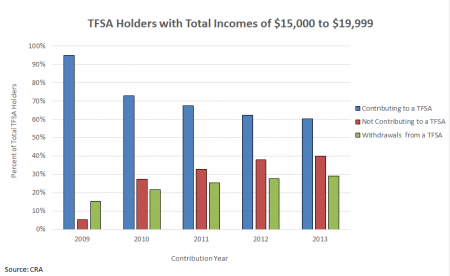 As the Department of Finance’s 2013 analysis suggested, the number of TFSA accounts and total contributions initially rose rapidly, as particularly seniors and owners of unsheltered assets transferred funds into TFSAs after they were introduced in 2009. 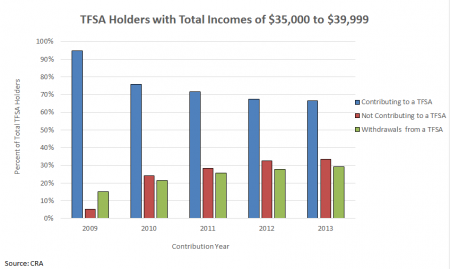 The number of TFSA holders contributing to their accounts quickly tailed off, however, falling from 93% initially to 63% in the 2013 contribution year. The share that maximized their contributions fell from 64% to under 18%. 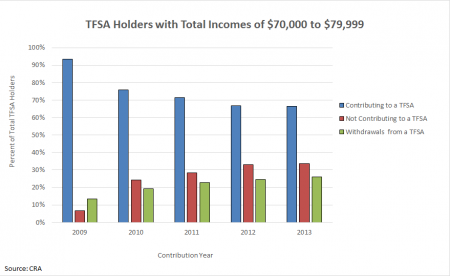 Over the same period, the number of account holders who contributed nothing to their TFSAs rose from under 7% to nearly 37%. In addition, the number taking money out of their TFSAs rose from less than 15% to over 27%, and the dollar value of withdrawals as a share of total contributions rose from 10% to 36%. 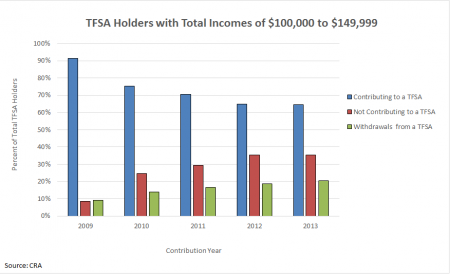 The pattern of a rising share of TFSA holders that contributed nothing to their accounts, or that withdrew money, is evident across the income spectrum. Just 5 years into the program, the leakage rate among TFSAs is far higher than 401(k) and RRSP leakage, which is generating growing alarm in the US and Canada — not surprisingly, since unlike those vehicles, TFSA withdrawals involve no tax hit. TFSAs may support short- and medium-term saving goals, but as a means of achieving retirement income adequacy, they suffer the familiar shortcomings of voluntary, individual savings schemes. As Employment Insurance benefits become accessible to fewer and fewer unemployed, TFSAs will remain the piggy-bank of choice to break open in the event of unemployment, to say nothing of other life events.